For a lot of people these days, the email inbox is like Grand Central Station with information coming and going constantly. Google is hoping to make that experience a little bit better for Gmail users by adding in even more time-saving buttons that they refer to as “quick action buttons.” Now you can get more done without having to leave the safety of your inbox tab. Coming soon to your Gmail inbox are buttons that allow you to act on the content of the email just through a simple click. 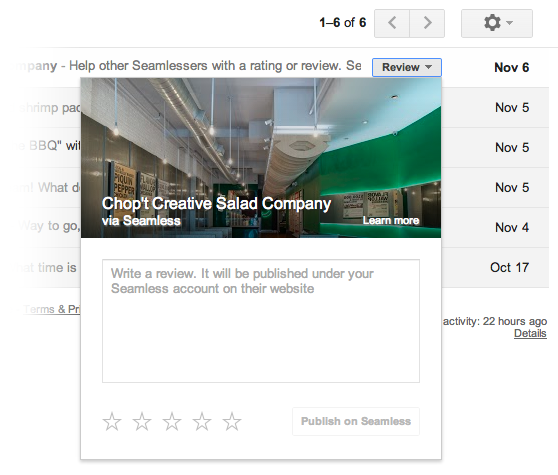 Google lists examples like reviewing a restaurant or changing your OpenTable reservation by tapping the little button that appears on the side of your email. Opening YouTube videos and Google Docs documents are also on the list and Google promises they are “continuing to add even more buttons” in the future. Sounds like it could really save some time, as long as you are ok with Gmail knowing the contents of your emails.